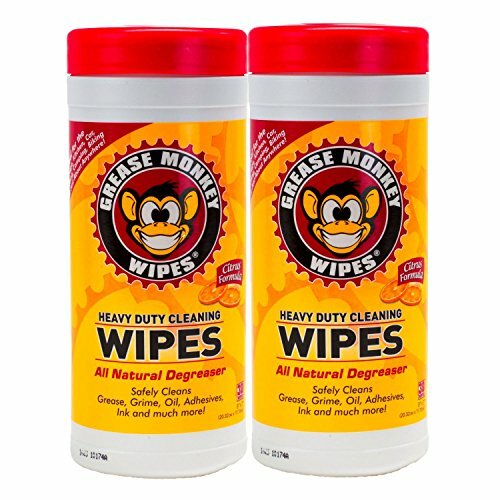 Grease Monkey Wipes Heavy Duty Multi Purpose Cleaning Wipes (Pack of 2), 25 Count Canister by Grease Monkey at Melon City Bike Club. MPN: GM2. Hurry! Limited time offer. Offer valid only while supplies last. Grease Monkey Wipes use a powerful, citrus formula to safely clean grease, grime, oil, lubricants, adhesives, ink and much more. No soap and water? Grease Monkey Wipes use a powerful, citrus formula to safely clean grease, grime, oil, lubricants, adhesives, ink and much more. No soap and water? No problem. Pre-moistened Grease Monkey Wipes are ideal for cleaning mobile messes associated with biking, boating, driving, fishing, hunting, camping, and much more. If you have any questions about this product by Grease Monkey, contact us by completing and submitting the form below. If you are looking for a specif part number, please include it with your message.